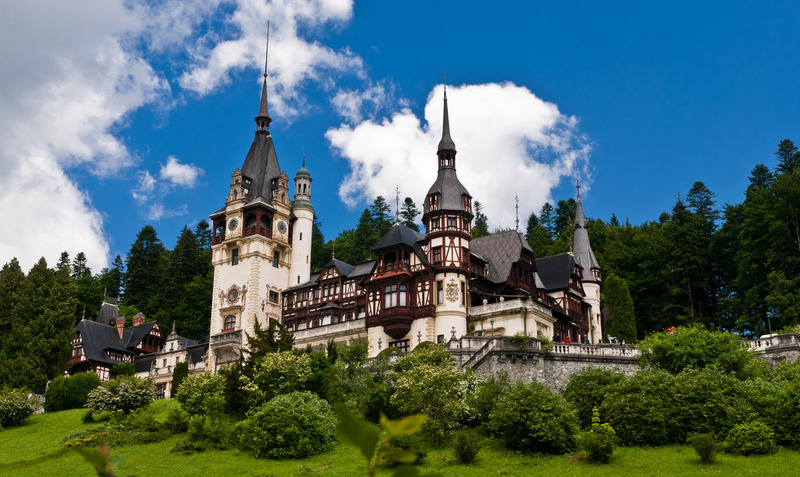 Located in Sinaia (44 km from Brasov), Peles Castle is considered by many one of the most beautiful castles in all Europe. The building of the castle began in 1873 under the direct order of the Viennese architect Wilhem Dodererand was continued in 1876 by his assistant, Johann Schultz de Lemberg. 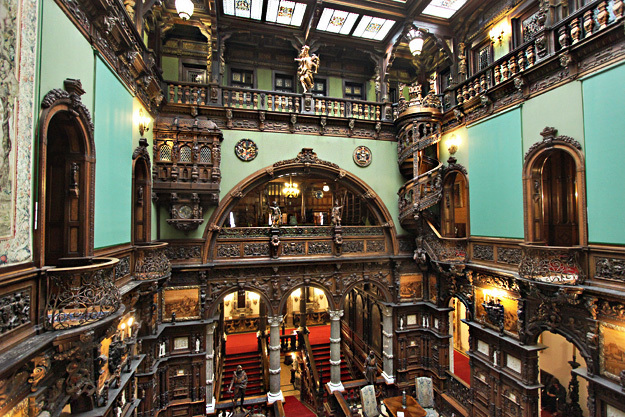 During 1877-1879 because of the war they abandoned work. That’s why the castle was inaugurated only on October 7, 1883. The location for the castle was chosen by the German prince Carol I de Hohenzollern, who was to become a king and it draws its name from the neighboring brooks which passes through the courtyard. 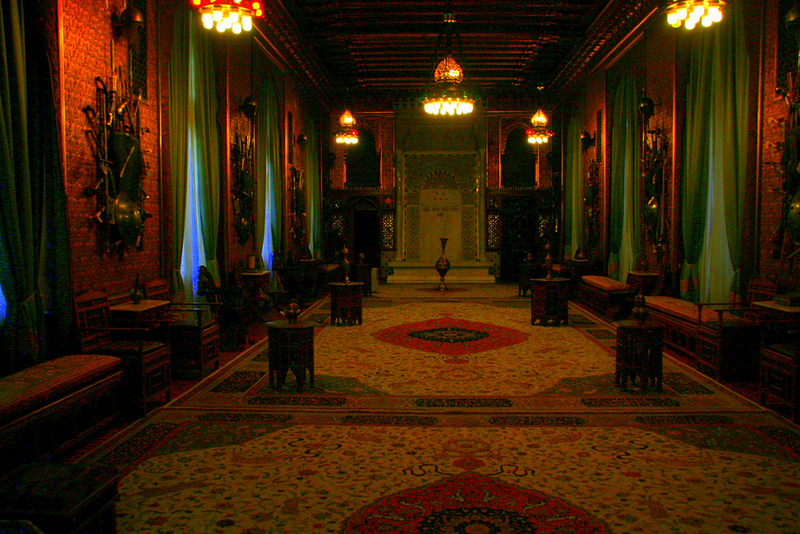 The castle was built in wood, stone, bricks and marble and comprises more than 160 rooms. The representative style used is German Renaissance, but one can easily discover elements belonging to the Italian Renaissance, Gothic, German Baroque and French Rococo style. Peles is surrounded by seven terraces decorated with statues (sculptured by the Italian, Romanelli), stone-made-wells, ornamental vases and Carara marble. 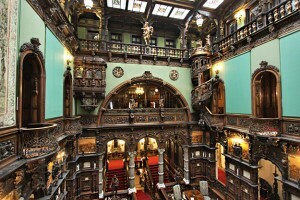 The architects used an abundance of wooden decoration, both for the exterior and for the interior of the castle, which confers a very special quality to the building. 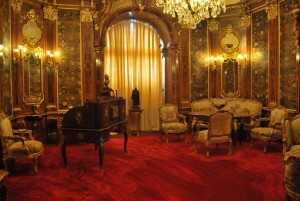 Quite outstanding are the Big Armory Room, the small Armory Room, the Florentine Room, the Reception Room (where paintings and wooden sculptures depicting 16 castles of the Hohenzollerns are exhibited), the Moresque Room, The French Room, the Turkish Room, the Council Room, the Concert Room as well as the Imperial Suite. 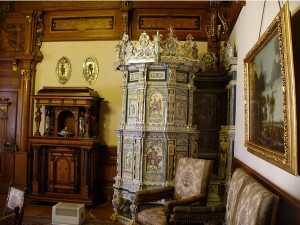 Other exquisite attractions such as the statues, the ceramics, the gold and silver plates, the Meissen and Sevres porcelain, the Murano crystal chandeliers, German stained-glass windows, walls covered with Cordoba leather, ebony and ivory sculptures, as well as the extensive weapon collections are worth mentioning. It is also important to know that Peles Castle shelters one of the most important and most valuable painting collections in Europe, almost 2.000 pieces. 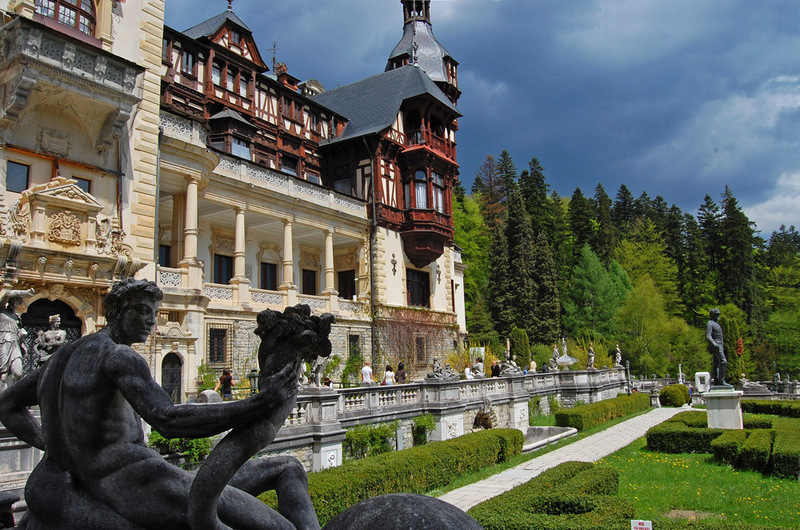 Almost adjacent to Peles Castle is Pelisor (“Little Peles”). 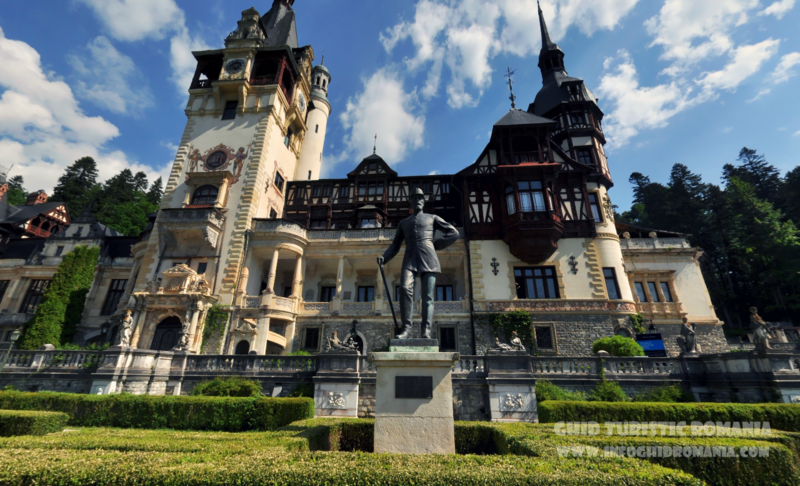 King Ferdinand, who succeeded Carol I, intended to use Peles Castle as a summer residence. Supposedly he found Peles too big and overwhelming, so he commissioned the smaller, art-nouveau style, Pelisor Castle. 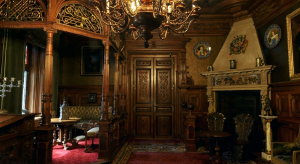 Pelisor’s 70 rooms feature a unique collection of turn-of-the century Viennese furniture and Tiffany and Lalique glassware. The Royal library attracts especially those who are keen on rare books, with leather covers engraved with golden letters. There is an attraction point even for those who are not familiar with the universe of books, namely the secret door, a way of access behind a book shelf through which the king could becalm in various rooms of the Castle. The armouries, arranged between 1903 and 1906, shelter more than 4000 European and Eastern pieces from the 14th and 17 centuries. The most valuable are considered to be the German armours from the 16th and 17th centuries and a complete armour for horse and knight, unique in Romania. The Music Room became a musical soirée salon at Queen Elisabeth’s wish. The furniture from this room was a gift from the Maharajah of Kapurthala. The Florentine Room, also called the Great Salon, impresses with its ceiling sculptured out of linden trees, gilded, with two great chandeliers, and its ornaments in the Italian neo-renaissance style. Maura Salon is the work of architect Charles Lecompte de Nouy, having Spanish-Moorish elements and an indoor Carrara marble fountain, replica of a similar piece in Cairo. The Playhouse has 60 seats and a royal box, being decorated in Louis XIV style. 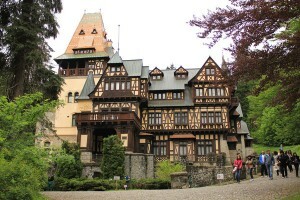 Near Peles castle there is Foisor, a kings’ residence with 42 rooms designed in the Swiss style. Castelul Peles (the Peles Castle) is located in Sinaia (44 kilometers far from Brasov and 122 kilometers far from Bucharest), and one can choose between the European road E60 and the national road DN1. In what concerns the railway, there are many trains that go from Ploiesti to the Valea Prahovei (Prahova Valley), and Sinaia Resort is one of the destinations. De ce am alege cazarea in regim hotelier?